Most revered perhaps of all the Hawaiian gods, Madam Pele is the center of much Hawaiian mythology and folklore. Goddess of fire and volcanoes, Pele’s power is seen throughout the creation and history of the islands. Her temper at times has erupted, therefore commanding respect for herself and for the land she rules. Pele’s presence is still felt in today’s culture, where locals and residents are careful to abide by her “laws” as not to offend her, or else risk the wrath of her curse. Before Madam Pele claimed her place amongst the volcanoes of Big Island, she traveled throughout Hawai’i searching for a suitable island to call home. Stories of her journey have led to the acknowledgement of many ancient sites that exist today. For instance, “Pele’s Chair” (seen in the photo above) is believed to be the last place that Madam Pele sat before departing the island of O’ahu. This large volcanic rock formation, resembling a throne of sorts from certain angles, gazes out over the ocean on the Ka’iwi Coast of O’ahu’s south shore. The chair itself is quite massive, only further eluding to the power of Pele. The throne creates an awe-inspiring image of the mighty goddess staring out over the islands, as if she knows she owns it all. The greatness that is often associated with Pele can definitely be felt at this location, with the combination of Hawaiian culture and beauty. The hike out to this iconic landmark is a quick mile (if that), but is certainly worth the trip. Beginning at the parking area for the Makapu’u Lighthouse Trail, the flat path veers off through the brush on its way to the shore. 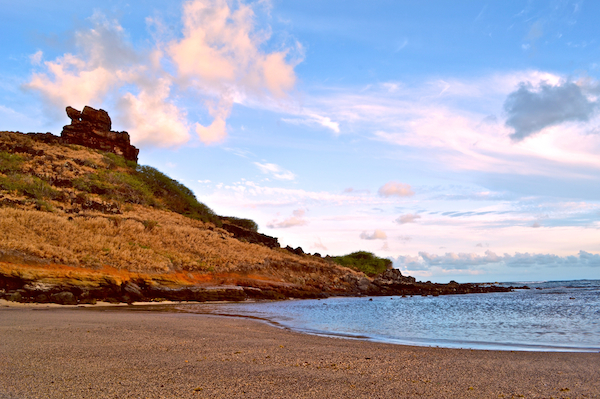 Upon reaching the coast, hikers can enjoy the small but beautiful beach that sits beneath Pele’s Chair, or can choose to climb up the lava rocks to get a closer look at the throne. On the opposite side of the chair are numerous tidepools, which are usually stirring with all sorts of life. This excursion is a great way to spend the afternoon, and is certainly family friendly. As you can see, Hawai’i is steeped in culture and tradition, and I find that the more I learn about these incredible islands that I live on, the more I can truly appreciate their beauty. Visiting places such as Pele’s Chair not only allow people to connect with nature, but with its history as well, providing an even richer experience for those seeking to be part of the land. Photograph of Pele’s Chair © 2011 Leigh Anne Crocco.